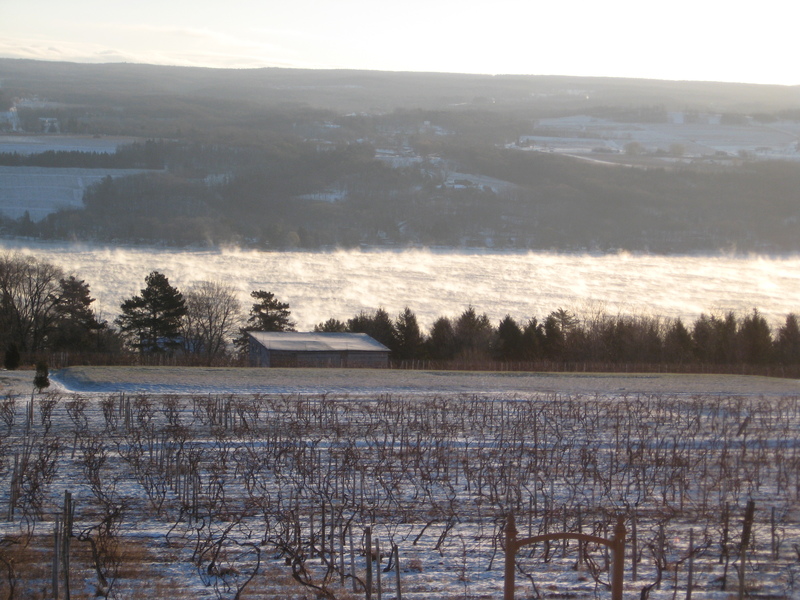 Finger Lakes vineyard, with Seneca Lake steaming on a 5 degree below zero morning. It flew in through my postal slot this week, a stiff green mailer I’ve received twice before: Continuing Gardener Sign-ups. It means that in February, I’ll toddle down to the public library, pay my small fee, re-read the rules, and confirm my plot. Ok, so I knew the mailer was coming since I am a Garden Coordinator, but it’s satisfying to jot the date on the calendar anyway, marking the beginning of my fourth growing season with the Capital District Community Gardens. We are in the midst of deep winter here in upstate New York; when it is absolutely necessary to wear gloves the minute you step out of doors or else risk wind-burned and skin-split fingers; when billowing road salt coats our cars and our street and our pants when we lean over those cars, even flies into our mouths if we are thoughtless enough to open them before tossing ourselves shivering back into our homes. The standard picture of Gardener Dreaming About Spring is someone escaping that salty, snowy weather, cardigan-wrapped and hugged by an overstuffed recliner. The silhouetted figure, plush-slippered, pores over seed catalogs by a roaring fire, sipping hot chocolate or spiked cider as the wind screams outdoors. I’m not exactly like that. Don’t own a recliner, fireplace, or seed catalogs, and slippers make my feet sweat. I clomp around the apartment in old socks and clogs and mostly I’ve used the seeds that are donated to the Community Gardens office or buy plants when the mood strikes me or they are on sale during the growing season. However, this year I’ve been thinking hard about my planting choices. For example, cherry tomatoes dominated my rows in the past–round red, little snips of yellow, some shaped like mini-butternut squash. I kept them because they volunteered from the first summer my garden was planted for me while I was recovering from surgery. Now I think I want plum tomatoes instead. The carrots were such a roaring success last summer, those tasty sweet morsels; if started early enough, multiple harvests would be possible. I desire green beans, but don’t want to mess with the strings. Maybe I’ll grow lacinato kale along with my rainbow chard. And broccoli-one of my fellow gardeners shared broccoli with me, I could do that! I love broccoli. 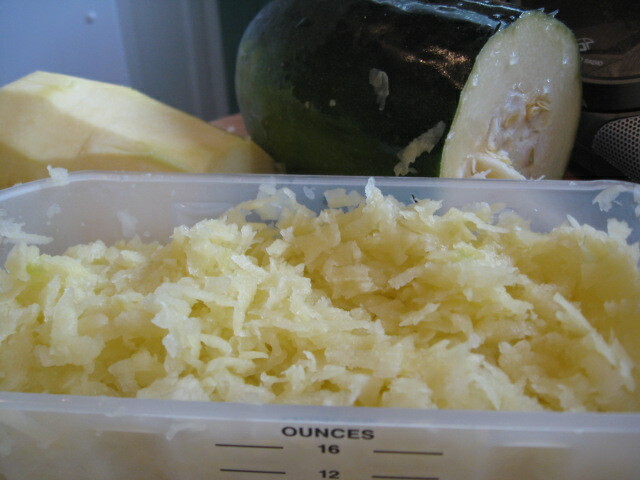 Perhaps I’ll plant the whole damn plot in flowers to cut for my dining table–then again, zucchini are not only traditional but useful. I am practicing making choices, not just doing what I did before, not doing what is merely expected. 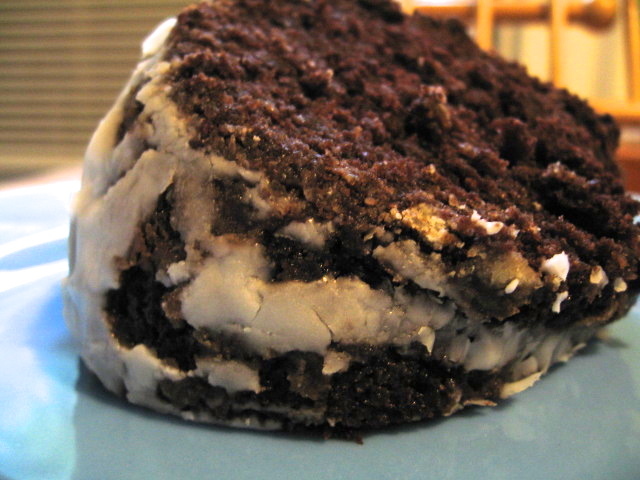 …to make chocolate zucchini cake! Another envelope arrived this week, not through the mail slot but in my email queue (the way of so much these days), announcing my acceptance to a yoga teacher training program. Another spring planting to look forward to, drowse with by the metaphorical fire–though a more active drowsing, as my challenge now is not only to plan but to become physically stronger and more disciplined in my yoga, before I arrive mid-April. I also must battle my demons of self-doubt, in order for the A+ student to go back to school in a new and different way. Like the garden, what do I plant? What do I discard because it doesn’t work for me? How can I be publicly not-perfect, in a setting (learning) where I was so driven before? The plan: to be relaxed like I am about my garden plot: not the best and not neglectful, something in-between. I’m going in as probably the worst student in Sanskrit names for poses, as well as a mediocre memorizer of everything else, with a life-battered body that hasn’t been doing yoga for very long. But my true subject matter will be one of the themes of Kripalu yoga: compassion. I will learn compassion toward myself. When I am “not successful” at a particular physical or mental task, I will attempt to be successful at compassion for myself, and gentle even in discovering my lack of compassion. This I can do, and it is all I need to bring. I vow to break out of my old gardener habits and make new ones, different ones, not sure what the harvest will be, but trusting it will be–something–something wonderful. Storms will come, and drought, and interruptions by the personal and political and societal–and the skills I’ve acquired in the garden will get me through what I’m calling “sleep-away camp” at Kripalu. Here at the end of January I open the seed catalog of my life, once again dreaming the future into being. 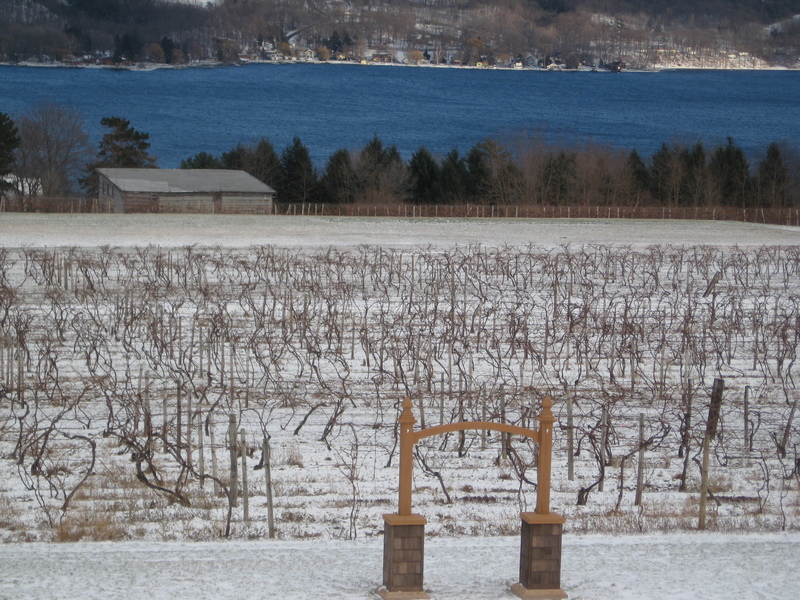 Seneca Lake warmed by the sun, readying for the rest of winter, and then spring! Who knows what transformed things will come out of this ground? This entry was posted in A+ Student Syndrome, Community Gardens, Food, Food and Cooking, Gardening, Living in the Moment, Yoga and tagged A+ student syndrome, broccoli, Capital District Community Gardens, career choices, carrots, cherry tomatoes, chocolate zucchini cake, community gardens, dreams, Finger Lakes, food, gardening, Kripalu, lacinato kale, living in the moment, meditation, nature, perfectionism, seasonal food, seed catalogs, Seneca Lake, spring, winter, writing, yoga, yoga teacher training by of-the-essence blog. Bookmark the permalink.